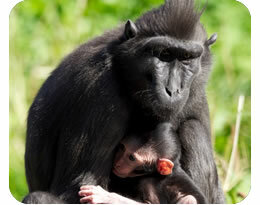 Sulawesi macaques (also known as crested black macaques and Celebes macaques) are threatened by the clearing of their habitat for logging and agriculture. They are also hunted for meat and are traditional Christmas fare in some areas. Youngsters are sometimes captured to become pets. Highly sociable, they spend much of their time in mutual grooming, mainly searching for grass seeds and dead skin caught in the fur. One of the ‘hamsters’ of the monkey world, Sulawesi macaques often stuff their cheek puches with food to eat later!